Dining with an ocean view does not have to wait until the summer months for patrons of Charley’s Ocean Grill in Long Branch, New Jersey. 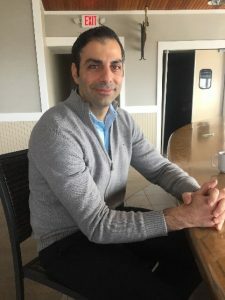 While the shore town is often quieter in the off-season, the new owners of the popular summertime spot, Mario Magriplis and Frank Lambrinos hope to keep the momentum into the offseason as well. Magriplis provides Bielat Santore & Company with a first look at what changes to expect at the restaurant they recently purchased. Working in the restaurant industry was part of growing up for both Lambrinos and Magriplis whose families excelled in the business. Magriplis lived in Canada and Greece where his family owned multiple restaurants and hotels, and Lambrinos was practically raised in the family business, the Blue Swan Diner in Ocean, NJ, which the duo also currently own. “We both grew up in the business and both decided to leave our professional careers in order to go into business for ourselves,” said Magriplis. Before the big crowd rolls in on Memorial Day Weekend, the partners are focusing on building relationships with their local customers. “There is a seasonal effect to the business but we aim to build on our local following. Our casual atmosphere and delicious food really do offer our patrons a local summer experience all year long,” said Magriplis. “We are trying to build on that culture.” Much of the restaurants’ previous success is credited to the location and the people who have dined at the restaurant since the eatery opened in 1985, serving as a focal point of the community and a meeting place for locals. “The restaurant is a landmark. There is a lot of history in Long Branch, and Charley’s is part of it,” said Magriplis. Guests can expect familiar faces serving them as most of the employees working under the former proprietors are still on staff. “The staff is an integral component to running a successful restaurant. The right people elevate an establishment and we are lucky to be working with talented individuals that are also good people.” Some additional developments include utilizing the upstairs banquet room for live music, specialty nights and VIP happy hours. They also plan to offer the available space for reservations and walk-ins when there is an influx in visitors. “We offer a unique experience, excellent food and drinks, with a casual setting,” said Magriplis. “It wouldn’t be a beach place if you have to wear a three-piece suit.” A new web page is in the works as well, featuring a new cocktail menu inspired by the local beat. We want to offer cocktails and dishes that make you feel like you are on vacation” said Magriplis. “Though we offer a casual setting, our drinks and food are of an elevated standard” The partners have gotten to know most of the very satisfied local customers, but they are also looking forward to meeting new customers as business floods in this summer. Charley’s Ocean Grill is open for lunch, dinner and drinks from 11:30 am until 2:00 am. Their banquet room seats 100 guests indoors with additional space at the cocktail bar and outdoor patio. Call the restaurant for a reservation at 732.222.4499 or visit their website at https://www.charleysoceangrill.com/.